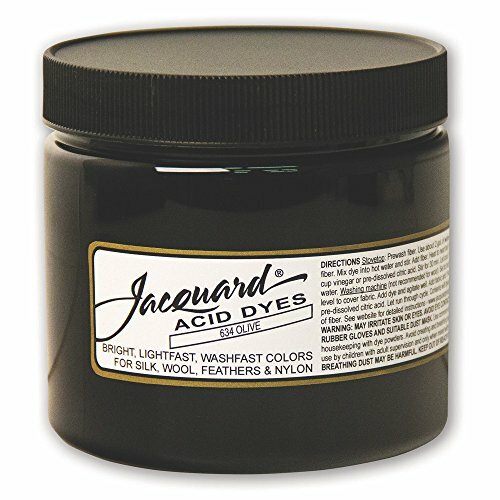 This 8 ounce jar of Olive Acid Dye by Jacquard is a hot water concentrated powder dye used to color silk, wool and other protein fibers (as well as some nylons). Extremely brilliant and colorfast, they exhaust extremely well and will not bleed or fade with washing. Jacquard acid dyes provide a uniform color when immersion dyeing and may also be used for direct painting or printing applications using a steam setting. Acid dyes are known to produce the most vibrant colors of all the colorants in the world. If you have any questions about this product by Jacquard, contact us by completing and submitting the form below. If you are looking for a specif part number, please include it with your message.